* Reliable clean HF start system for easy starting without contamination. The welder features real low end amperage control for working on thin work pieces as well as the power for much thicker work when required. This machine is a professional quality unit and offers a fantastic range of use. Despite its amazing price it is extremely well featured and performs very impressively - best of all its backed up by our solid PlasmaPart 2 Year warranty and technical expertise. 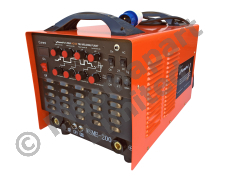 We sell a huge number of welders & plasma cutters and offer machines of all sizes, this is the most affordable way to get hold of a well sorted, good quality, high performance ACDC TIG with good quality backup advice and spares. The TIG is extremely well specified and features a flexible head Trafimet torch, foot pedal, and high quality leads. With this machine you will be able to weld Aluminium and it's alloys, titanium, stainless Steel, mild steel, copper and most other metals with the correct filler, gas and tungsten. You will not beat this combination of specification, backup and price!